Morgan Chase here, 2014 grad. I was just reaching out because since graduating from IUP I’ve been working with a non-profit called the Fund for Equality. 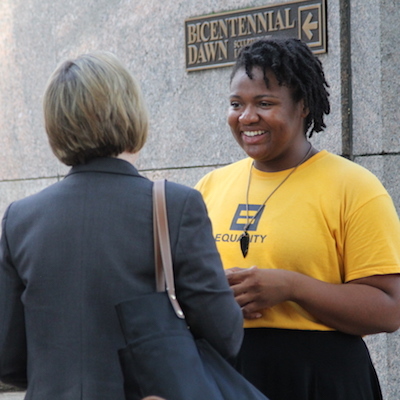 The Fund partners with the Human Rights Campaign to win hard-fought campaigns to protect LGBTQ equality. This fall/winter/summer, Fund for Equality is tackling some big issues, and we’re looking for people ready to make real change happen. As far as HC questioning goes we’re more on the “Therefore what should we do?” side of things. Applications are now being accepted for the student seat on the IUP Council of Trustees. Application/nomination forms are available in the Office of the President, 201 Sutton Hall, and online: Student Trustee Application/Nomination Form. Completed applications must be submitted to the Office of the President, 201 Sutton Hall, by 4:30 p.m. on Tuesday, November 8, 2016. To be eligible, a candidate must currently be (in fall 2016) at least a first-semester sophomore with an expected graduation date not earlier than May 2019. The successful applicant must be in good academic and student conduct standing and must have leadership experience and strong communication skills. A representative from the Washington Center will be doing a special presentation for Honors College students in the Great Hall on MONDAY, SEPTEMBER 19 from 6-7 p.m.
Cook Honors College students have participated in the TWC every year for as long as I can remember. Please plan to attend if you are interested in pursuing an internship in the DC. There are generous scholarship opportunities available as a result of the affiliation between IUP and TWC, and Achievement Funding may also support your participation. The Washington Center for Internships and Academic Seminars is an independent, nonprofit organization serving hundreds of colleges and universities in the United States and other countries by providing selected students challenging opportunities to work and learn in Washington, D.C. for academic credit. The largest program of its kind, The Washington Center has 70 full-time staff and more than 50,000 alumni, many of whom are in leadership positions in the public, private, and nonprofit sectors. Visit their website at http://www.twc.edu/. Send me an email (kevinb@iup.edu) if you plan to attend, so I can track interest. Pittsburgh Education Recruitment Consortium Job Fair Candidate Registration is now open. Join us for one of the largest education job fairs in the country. We anticipate another substantial recruitment event with school districts and related employers. Below are registration instructions. For more information visit the Pittsburgh Education Recruitment Consortium Job Fair website. Review all information carefully so that your job fair registration is accurate and successful. Check out the PERC YouTube videos for tips about attending the PERC Job Fair. 10:00 a.m.–3:00 p.m. | Monroeville Convention Center, Monroeville, Pa.
Student/Candidate Registration will open in the spring semester. Employers attending WestPACS, the largest job fair in the Pittsburgh region, are seeking alumni, graduating students, and underclassmen with experience in: Accounting, Business/Management, Commercial Art and Graphic Design, Communication and Public Relations, Computer Science and Information Technology, Criminal Justice, Education, Engineering, Finance, Fine Arts, Government/Public Administration, Health Care, Hospitality, Human Resources/Personnel; Law/Paralegal, Liberal Arts, Nursing, Office Administration, Parks and Recreation, Sales and Marketing, Sciences, Social and Human Services, and Writing/Journalism. The IUP Spring 2016 Career Fair provides an opportunity for students to explore jobs and internship opportunities in criminology, summer employment, government, and public service. 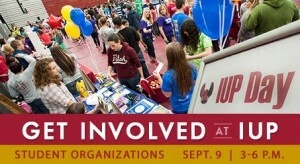 The fair is open to employers in all fields seeking students from any of IUP’s more than 175 academic majors and certificate programs for full-time, part-time, seasonal, and internship employment.